Welcome To The Aim High Foundation a nonprofit educational foundation expanding on the concepts originally thought in the martial arts industry developing multiple ways of impacting our community. Call 503-640-8628 today to get involved! — ... The Aim High Foundation's Promise. MISSION: Guided by the needs of our students, clients, team members and families, we will positively impact the community we serve by using multiple educational methods to teach life skills, martial arts, and over-all human development. We will combine win-win solutions with our partners and clients as an added value to that organization’s mission, all while teaching the method of ‘doing good’ to our students and clients. Aim High is a global community of educators and idealists working towards individual and collective progress. We are an action based culture and a people first environment. OUR PURPOSE: Aim High works to redefine what the understanding of ‘martial arts’ is in today’s world. Through happiness, health, and mentorship Aim High will provide methods of education that will increase the student’s and client’s awareness of self-defense, not only in combative arts, but in martial arts of life-style, education, fitness, and over-all development in all areas of life. Aim High works to take what is learned, out of the dojo and into the real world through multiple ways. VISION STATEMENT: Aim High is a leader in the martial arts and family service industries. We are redefining what ‘Martial Arts’ is, in today’s world. Aim High looks for opportunities to develop its mission and purpose with continually seeking out new methods, operation standards, and growth. With multiple locations to provide service such as a martial arts school, a charter school, or with the Aim High Foundation, Aim High can increase resources and provide its services to a broader client. We believe in deep collaboration and cross-development of other charities and groups, which allow us to innovate in a way that others cannot. We are an action based, results oriented and people first non-profit company. 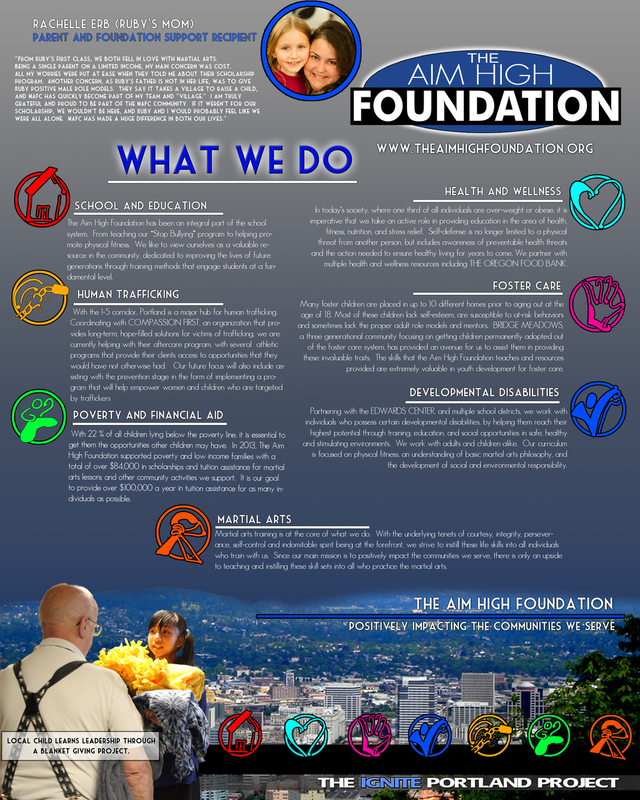 FOUNDATION VISION STATEMENT: As of October 1st 2013 Aim High launched a first in the martial arts industry to include a foundation branch to lead in all nonprofit sector projects to include fundraising, charity and family help projects, tuition assistance and scholarship aid along with events and action items that go along with those needs. The Foundation is run as a branch of Aim High Academy of Martial Arts focusing on the nonprofit development while allowing for the Martial Arts schools to focus on service all while guided under the Foundation Board and Academic Board of Directors. DEVELOPMENT UNDERSTANDING: The organization started in May of 1998 as Living History International, a company set up to teach students on the history of certain areas of time. The organization was re-launched in January of 2009 by Danny Sikkens, founder, and amended the name to Aim High Academy of Martial Arts, Inc., and filed as an educational facility with the Federal and State corporation sectors. We were accepted and recognized as Aim High Academy of Martial Arts, Inc. an educational nonprofit 501(c)3 in February 2009 with the amended documents including these bylaws. This company has always held the same Employment Identification Number and as a 501(c)3 corporation.